Britain’s decision to leave the European Union (EU) reflects widespread dissatisfaction with EU governance. The rejection of EU governance highlights the inherently unstable nature of the organization. If individual members experienced long-run benefits, defections would not occur. Instead, the people of Europe would press for a formal merger. If individual members become dissatisfied, these countries are likely to break away. Why would a dissatisfied and democratic country like the United Kingdom look to remain? Most, including us, believed the vote would lean toward maintaining the status-quo. This exit vote marks the first tangible step backward from the decades old vision of a united Europe. Europe’s financial and political leaders will redouble efforts to shore up the remaining union. Britain and the EU will negotiate the terms of separation against the backdrop of next year’s French and German elections. The British referendum may feed existing anti-EU sentiment, raising the specter of further defections. For this reason, we see the Brexit vote as a significant political event in the evolution of the Eurozone project. We expect the uncertainty that will come with Britain’s exit to be rancorous and lengthy. We do not expect Britain’s exit from the EU to significantly harm growth in the near-term. The UK accounts for roughly 4% of global GDP, and a localized recession in the UK would have little impact on global output. For the United States, the total value of imports and exports to the U.K. is roughly $100 billion, or 0.5% of GDP. This $100 billion is also small relative to the $4.9 trillion value of total U.S. trade (imports plus exports). As you can see, the direct impact on the U.S. economy from a localized U.K. recession should be modest. What about confidence? Could an extended bout of market unrest undo the small amount of forward momentum we are seeing in the data? This is a risk scenario that needs to be monitored. For now, however, we see markets adjusting rationally to unexpected news. The Dow Jones Industrial Average fell over 600 points Friday. This 3% drop erased significant gains just prior to the vote, leaving the total equity decline for the week was just over 1%. The cost to insure against European sovereign defaults rose, but is far below levels seen during prior episodes of stress. In short, it is far too early to conclude that the Brexit will have a lasting negative impact on confidence or investment. As the Brexit drama grew to a crescendo, we continue to see some improvement in the data. The WCA Fundamental Conditions Barometer rose in May to 45. Through May, we saw some improvement in financial conditions and global manufacturing. 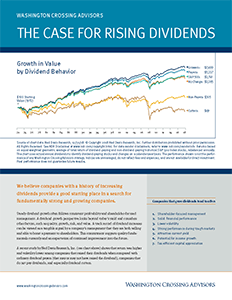 Recent volatility and weak reports on June business investment suggest growth will remain slow. 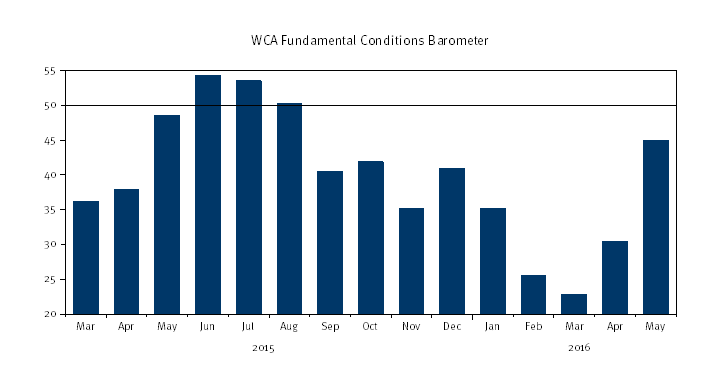 The first chart below shows the recent improvement in our WCA Fundamental Conditions Barometer. 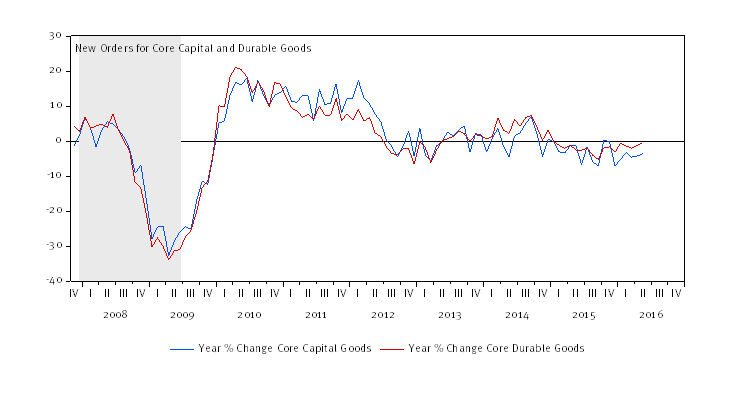 The second chart below shows the still negative performance for core durable and capital goods orders. 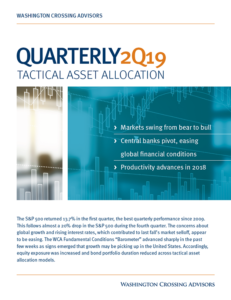 In short, there seems to be mixed-but-improving fundamental economic data, but investment and earnings trends are likely to remain a drag. In our view, the Brexit-related spike in volatility will likely remain contained. If we are right, the passage of time will clear away some of the immediate uncertainty and eventually lead to a better outlook for equities. The Dow Jones Industrial Average is an index that shows how 30 large, publicly owned companies based in the United States have traded during a standard trading session in the stock market.